Ready to easily create beautiful, attention grabbing craigslist ads? 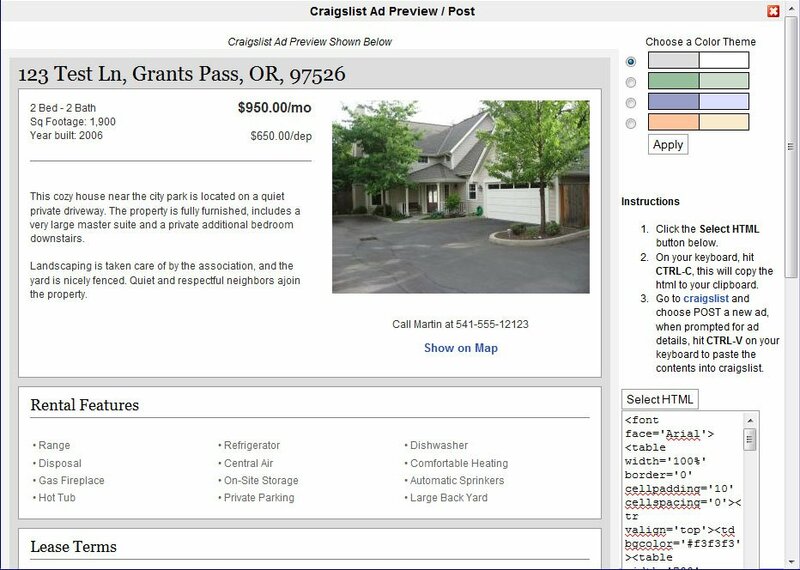 We’ve just made it as super simple with our new craigslist listing generation tool. Right click the vacant property, choose File Library, and upload photos. Select the check-mark to make them available for external listings. Right click the vacant property, choose Edit Property. From the property menu (upper-right), choose Profile / Marketing. Enter the information here that you would like to see in your listing. When done editing, click Save Changes. Click the link to Preview and setup your Craigslist listing on the right. Choose your theme, then follow the simple instructions to post your craigslist listing on the right panel. That’s all there is to it to have the best looking craigslist listings in town! Listing your property on other sites that accept HTML? Feel free to use the same process and paste the code into any other site that accepts HTML formatting.